I have one Wazia 4.6 light 120 tpi studded and one Cake Eatter 4.6 light 120 tpi studded for sale $140 each plus shipping. 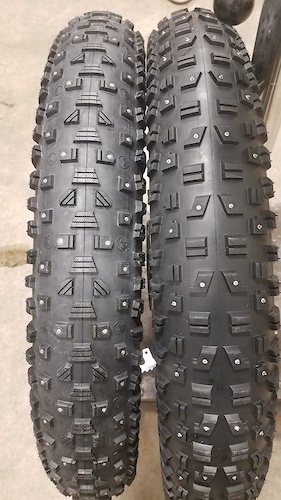 These are lightly used for one season with no missing studs and they were set up tubeless, so there is Stan's residue in the tires. I have one 45nrth 29x2.35 Nicotine 120 tpi studded for sale also for $60 plus shipping. New Medium 15.5 inch Soma Sandworm fat bike. Tange Infinity Cro-mo frame rides like the Soma Juice. Rohloff and Gates carbon belt drive compatible frame with sliding dropouts. Salsa Cro-mo fork with anything cage mounts. Salsa and Niner handle bar and stem, Cane Creek headset, lock on grips and Thudbuster, FSA Commet crank, Shimano BB, Raceface bash guard and ring, Shimano XTR 1x10 shifter and rear derailleur, Avid bb7 brakes, White Industry front and 616 Fabrications rear hubs laced to 26x80mm Mulfuts.